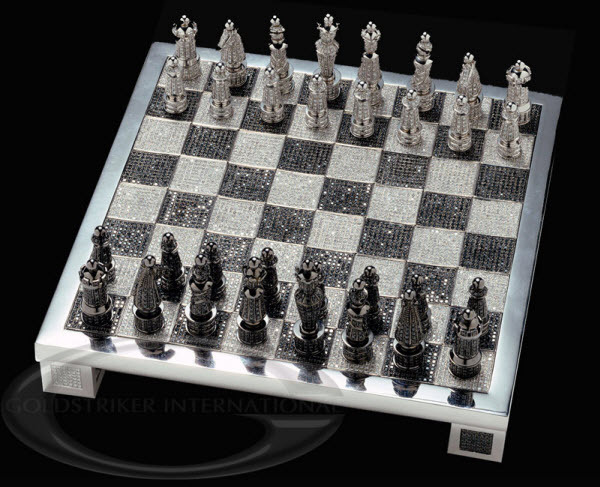 "The Royal Diamond Chess" entirely hand-made in 14-carat white gold, set with approximately 9900 black and white diamonds, is an extraordinary luxurious version of the classic chess-set. Designed by the renowned French artist, designer and master of jewelry, Bernard Maquin, and as part of the Charles Hollander Collection, "The Royal Diamond Chess" is a rare and precious work of fine art jewelary. This entirely hand-made creation is an expression of meticulous artisanship. With a harmonic combination of aesthetics, functional is and beauty.